CS-Cart requirements for web server environment are quite typical and most of hosting providers are able to meet them: either shared hosting accounts or dedicated servers. MySQL version 4.1 or greater. 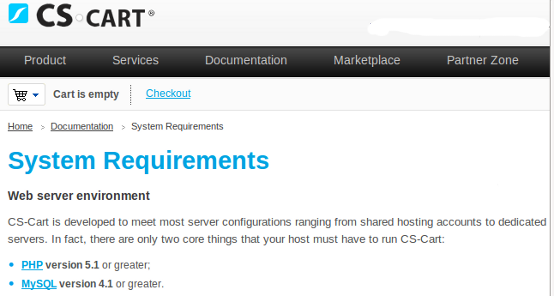 CS-Cart is compatible with almost every server that supports PHP and MySQL. However, Apache or any interchangeable alternative is recommended as the most reliable and stable server for your web store. CS-Cart shopping cart software works well on Windows-based server as well as Unix-like operating systems, Unix-like operating systems (such as FreeBSD or Linux) are strongly recommended by developers due to some features of these systems – such as: scalability, security capabilities and higher performance level. "Right on-this hpleed me sort things right out."